Is compulsive gambling ruining your life? Would you like to stop gambling? Can you imagine your life free from addiction? Would you like to regain control of your time, life and money? Cut Your Losses can resolve your gambling addiction. Over the past few years poker machine and gambling addictions have become a major social problem in Australia prompting New Farm Hypnotherapy to develop the program Cut Your Losses. 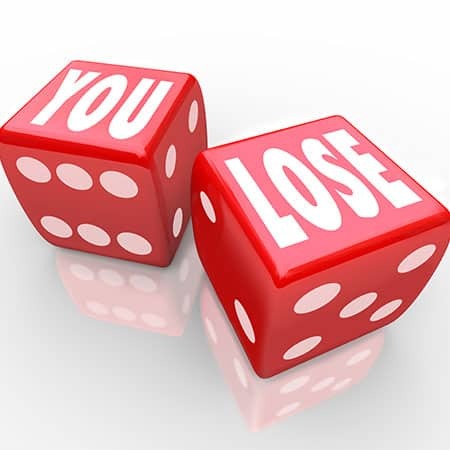 Cut Your Losses provides effective strategies for stopping or reducing gambling, particularly the use of gaming machines or pokies. It is estimated that during 2011 more than 70% of Australians participated in some form of gambling. For most people, gambling is a form of entertainment that is enjoyed responsibly. However, some people can experience significant harm from gambling and up to 500,000 Australians are at risk of becoming, or are, problem gamblers with 1 in 6 people who play the pokies regularly having a serious addiction. The social cost to the community of problem gambling is estimated to be at least $4.7 billion a year. Since developing this program at New Farm Hypnotherapy, we have successfully treated many people helping them to stop compulsive gambling. For some clients gambling is no more than a bad habit, while others may have issues at a subconscious level that cause them to gamble. Cut Your Losses uses hypnosis and addresses both the habit and any underlying or subconscious issues. Addiction, whether drug related or based on compulsion, is brought about by patterns or habits formed in the subconscious mind. Cut Your Losses is a personalised program which by using a combination of hypnotherapy, counselling and NLP will help you regain control your thought processes and change your motivation and view of gambling. Cut Your Losses will change the way you think and act allowing you a fresh start without negative thoughts or feelings. You’ll find yourself calm and positive as your perception changes and you replace gambling with more positive behavioural patterns. If you feel that you are gambling compulsively or that you are not in control Cut Your Losses, our hypnotherapy program for gambling addictions will help you get back on track. The program comprises one-on-one hypnotherapy sessions, a personalised plan for change and self-hypnosis CDs / MP3s to use between sessions. To make an appointment to stop gabling call New Farm Hypnotherapy Clinic on 07 3254 1373, complete the form below or email appointments@brisbanehypnosisclinic.com.au. If you’d like to know more, call the clinic and have a confidential talk with one of our therapists. For many, gambling is a popular pastime. Pokies, lotto, scratchies, card games, racing, and other forms of betting are forms of gambling prominent in Australia. Gambling is fun to do from time to time, but for others it can get out of hand and cause distress and financial problems. Over 80% of Australian adults engage in gambling of some kind, which is the highest rate of gambling in the world. This number includes some 4% of the adult population who play the pokies once a week, accounting for some 62% of locals’ annual gambling spend. Gambling is a significant public health issue, with around 80,000 to 160,000 (or 0.5 – 1.0%) of Australian adults experiencing significant problems from gambling and a further 250,000 to 350,000 (or 1.4 – 2.1% of adults) experiencing moderate risks that may make them vulnerable to problem gambling. If some of any of these apply to you, your gambling may be getting out of control and you should consider seeking help. The Cut Your Losses program can help you get back on track. Would you like to know more about how hypnotherapy can help overcome a compulsion to gamble? Fill in the form below, email us at appointments@brisbanehypnosisclinic.com.au or call on 07 32541374 and come in for an obligation free chat with one of our team.